The Water Resources/Environmental Science and Engineering (WRESE) program facilitates Ph.D.-level course offerings in water-related disciplines, and coordinates offerings of these courses. Furthermore, the WRESE program serves as a focal-point for water-related graduate research and education at the University of Wyoming. This interdisciplinary degree program encourages cross-department and inter-college coordination for research and education in hydrology and water resources. 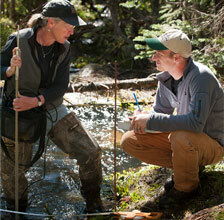 Ginger Paige and graduate student Matt Hayes, in the Snowy Range Mountains collecting data. Water: the limiting factor in human development around the globe.